The clade Myxini includes at least 20 species of hagfishes. Hagfishes are eel-like scavengers that live on the ocean floor and feed on dead invertebrates, other fishes, and marine mammals ([link]). Hagfishes are entirely marine and are found in oceans around the world, except for the polar regions. A unique feature of these animals is the slime glands beneath the skin that release mucus through surface pores. 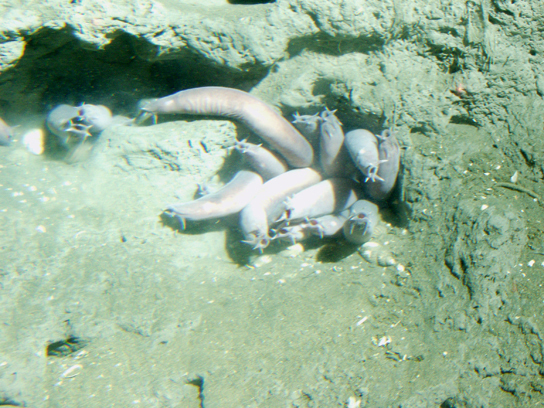 This mucus allows the hagfish to escape from the grip of predators. Hagfish can also twist their bodies in a knot to feed and sometimes eat carcasses from the inside out. The clade Petromyzontidae includes approximately 35–40 or more species of lampreys. Lampreys are similar to hagfishes in size and shape; however, lampreys possess some vertebral elements. Lampreys lack paired appendages and bone, as do the hagfishes. 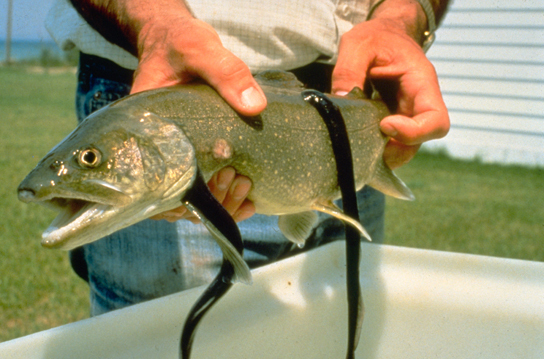 As adults, lampreys are characterized by a toothed, funnel-like sucking mouth. Many species have a parasitic stage of their life cycle during which they are ectoparasites of fishes ([link]). Early gnathostomes also possessed two sets of paired fins, allowing the fishes to maneuver accurately. Pectoral fins are typically located on the anterior body, and pelvic fins on the posterior. Evolution of the jaw and paired fins permitted gnathostomes to expand from the sedentary suspension feeding of jawless fishes to become mobile predators. The ability of gnathostomes to exploit new nutrient sources likely is one reason that they replaced most jawless fishes during the Devonian period. 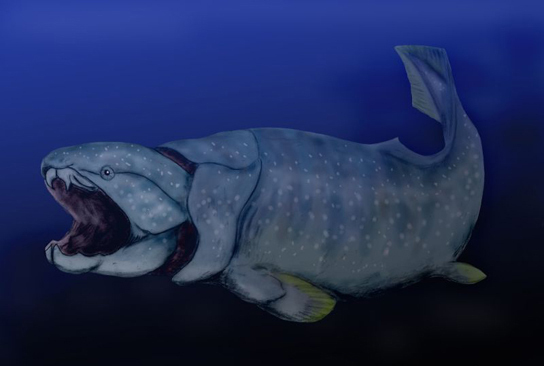 Two early groups of gnathostomes were the acanthodians and placoderms ([link]), which arose in the late Silurian period and are now extinct. Most modern fishes are gnathostomes that belong to the clades Chondrichthyes and Osteichthyes. The clade Chondrichthyes is diverse, consisting of sharks ([link]), rays, and skates, together with sawfishes and a few dozen species of fishes called chimaeras, or “ghost” sharks.” Chondrichthyes are jawed fishes that possess paired fins and a skeleton made of cartilage. This clade arose approximately 370 million years ago in the early or middle Devonian. They are thought to be descended from the placoderms, which had skeletons made of bone; thus, the cartilaginous skeleton of Chondrichthyes is a later development. Parts of shark skeleton are strengthened by granules of calcium carbonate, but this is not the same as bone. Sharks reproduce sexually, and eggs are fertilized internally. Most species are ovoviviparous: The fertilized egg is retained in the oviduct of the mother’s body and the embryo is nourished by the egg yolk. The eggs hatch in the uterus, and young are born alive and fully functional. 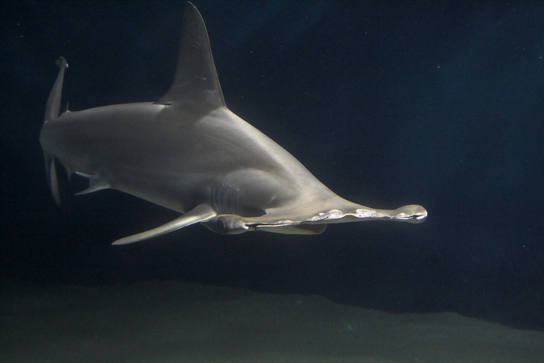 Some species of sharks are oviparous: They lay eggs that hatch outside of the mother’s body. Embryos are protected by a shark egg case or “mermaid’s purse” ([link]) that has the consistency of leather. 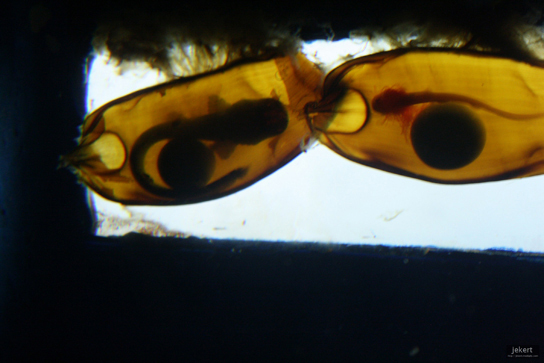 The shark egg case has tentacles that snag in seaweed and give the newborn shark cover. A few species of sharks are viviparous: The young develop within the mother’s body and she gives live birth. 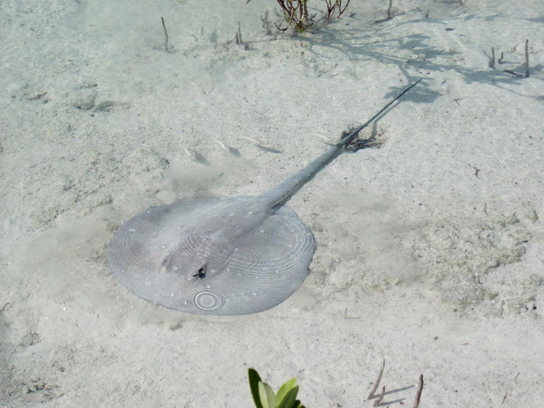 Rays and skates comprise more than 500 species and are closely related to sharks. They can be distinguished from sharks by their flattened bodies, pectoral fins that are enlarged and fused to the head, and gill slits on their ventral surface ([link]). Like sharks, rays and skates have a cartilaginous skeleton. Most species are marine and live on the sea floor, with nearly a worldwide distribution. Actinopterygii, the ray-finned fishes, include many familiar fishes—tuna, bass, trout, and salmon ([link]a), among others. Ray-finned fishes are named for their fins that are webs of skin supported by bony spines called rays. In contrast, the fins of Sarcopterygii are fleshy and lobed, supported by bone ([link]b). Living members of this clade include the less-familiar lungfishes and coelacanths. Members of Chondrichthyes are thought to be descended from fishes that had ________. What can be inferred about the evolution of the cranium and vertebral column from examining hagfishes and lampreys? Why did gnathostomes replace most agnathans? Evolution of the jaw and paired fins permitted gnathostomes to diversify from the sedentary suspension feeding of agnathans to a mobile predatory lifestyle. The ability of gnathostomes to utilize new nutrient sources may be one reason why the gnathostomes replaced most agnathans. Fishes by OpenStaxCollege is licensed under a Creative Commons Attribution 4.0 International License, except where otherwise noted.